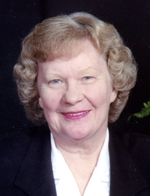 Shirley I. Woosley, 83, passed away peacefully at 9:30 a.m. Wednesday, Sept. 27, 2017, at Pilgrim Manor in Plymouth where she has made her home for the past four years. She was born Feb. 7, 1934, in Palatine, Ill., the daughter of Edward R. and Rose (Spoerl) Petersen. Shirley received her education at Proviso East High School graduating with the Class of 1952. On Aug. 15, 1953, in Melrose Park, Ill., Shirley married Charles M. Woosley. They shared 43 years together before his passing on July 2, 1996. They were members of St. John’s United Church of Christ in Melrose Park before the couple moved to Plymouth in May of 1996 and then worshipped at the First United Church of Christ. The Woosley family spent several summers on Pretty Lake. Shirley first worked as a nurse’s aide in West Lake Hospital in Melrose Park and retired after 25 years as vice president of the Maywood Proviso Bank. She enjoyed sewing, bingo, camping, fishing, the Chicago Bears and especially time spent with her family. Shirley was an expert at baking birthday and wedding cakes. Her door was always open to those in need. She is survived by her children and families, Pamela (Howard) Hendon, Plymouth, and daugther, Amy (Brandon) Warner, Sandra J. (Thomas) McDowell, Harvey, Ill., and children, Thomas, Evie and Timothy McDowell, Glen C. (deceased) and Lori Woosley, Villa Park, Ill., and children, Bradley, Eric and Margaret, Mark E. (Eileen) Woosley, Glendale Heights, Ill., and children, Ryan, Taylor and Ashley, Chris P. Woosley, Park City, Ill.; as well as three great-grandchildren. She was preceded in death by her husband; and a brother, Edward P. Petersen. Visitation will be held from 10 a.m. to noon, Monday, Oct. 2, at the First United Church of Christ, 321 N. Center St., Plymouth, where services will begin at noon with Rev. Charles Krieg officiating. Burial will be in the New Oak Hill Cemetery, Plymouth. A reception will immediately follow in the church fellowship hall. Memorial gifts may be given to the church. Johnson-Danielson Funeral Home is handling the arrangements.